As you’ll have seen in Kim Bromley-Derry’s recent blog, the Taskforce has been discussing what it needs to focus on over the next few years. So, strong foundations to build on! The Taskforce has now published its action plan covering 2018 through to 2020, setting out goals for each year. It is very mindful that its DCMS funding (£500k per annum) ceases in March 2020, and it wants to ensure that library services seamlessly continue to receive the support they need up to, and beyond, that point. To achieve that, the Taskforce team’s work needs to become mainstreamed into other Taskforce member organisations well before March 2020. Therefore, at its last meeting in March, the Taskforce agreed a transition plan, setting out the work that needs to continue, who should take over its leadership, and from when. This has subsequently been considered and endorsed by the Libraries Minister and the Local Government Association’s Culture, Tourism and Sport Board (as the Taskforce’s joint sponsors). 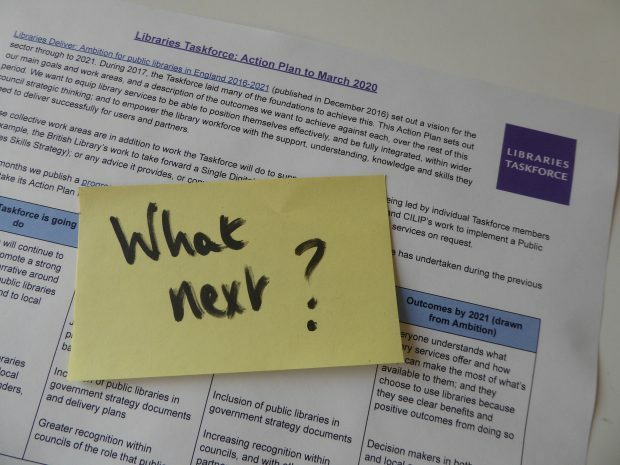 In summary, most of the Taskforce team’s work will eventually transition to either the DCMS Libraries team (as policy lead) or Arts Council England (to build on its role as the library development body). In the main, we’re aiming to achieve this from October 2018. This should then allow plenty of time for the work to be fully embedded into the relevant organisations prior to Taskforce funding ceasing. To ensure a smooth transition of activities from the Taskforce team to ACE, a secondee from ACE (Sophie Lancaster) is now located with the Taskforce team (she’ll be with us from April to October 2018). 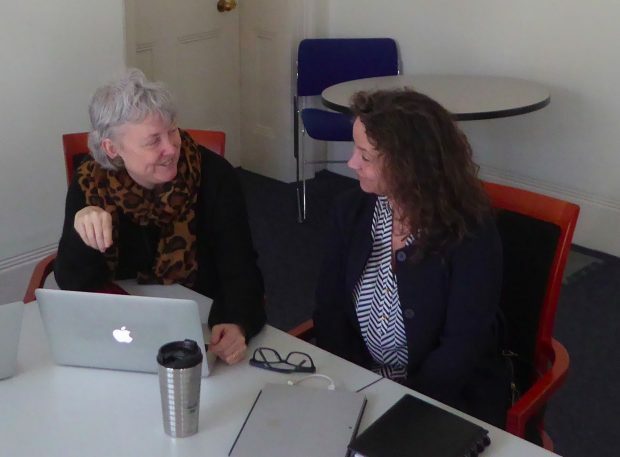 During that time, with support from the Taskforce team, Sophie will start to lead on activities to be transitioned over to ACE (such as secretariat functions, oversight of research, good practice sharing and toolkit work). This will build an understanding of what is required to sustain this work and ensure no momentum is lost. And recognising the increase in workload for the DCMS Libraries team, the department has begun a recruitment process to boost its capacity. DCMS and the Taskforce team will work closely together in the run up to October 2018 to ensure work transitions seamlessly. The Taskforce agreed that further scoping work would be needed on some topics before a new home could be decided on. The Taskforce Team’s communications lead will undertake a piece of work looking at Taskforce communications - for example where various Taskforce documents and resources (currently located on the Taskforce’s GOV.UK site or blog) might best sit, and how the monthly newsletter for library staff and media monitoring reports might be handled in future. Her proposals will be discussed at the Taskforce’s June meeting. There are some time-limited pieces of work led by the Taskforce team that will continue, even though these may not be completed until after most of the team’s functions transition to DCMS or ACE. These include: publication of the Libraries: Opportunities for Everyone (LOFE) innovation fund evaluation report; masterclasses on evaluation tools and techniques; work on the core dataset; and development of a new Library Management System requirements document. So from October 2018, it’s planned that any outstanding work, plus the people delivering it, will transition into the DCMS Libraries team until that work is finished. As we get closer to October 2018, we’ll share more information - for example, who the lead contacts will be for particular pieces of work. In the meantime, please contact the Taskforce team (librariestaskforce@culture.gov.uk) as usual.